The sandwich was okay. Had a little spice to it. The bread was tasty. Also the mix of flavors is great. The gumbo was really bad. Brown broth with pieces of chicken and no rice. It also had chunks of okra and celery. Not my favorite food truck. I got the Madrid Lunchbox (sandwich, chips & water) and got it very fast. Sandwich was very tasty, the chorizo was good and it was well seasoned (good bread too). The chips were good ('Dirty Potato chips' brand). My only complaint was the small size of the sandwich. Not a good truck to go to if you're really hungry. Most of the food trucks seem pretty expensive considering how much lower their expenses must be. I really like the sandwiches from SUNdeVICH. Great bread, great ingredients, all around great execution. My only complaint is that the sandwiches from the truck are MUCH smaller than those from the B&M store, and I don't think they are proportionally cheaper. Sandwich was just the right size to get the combo and not feel bloated. Caution this sandwich is MESSY, runny egg yolk and sauces, but ohhh so worth it. Great balance of spice to the creamy avacado, and egg richness. Bread was perfectly chewy with a bit of crispy bite. Gonna be back to try some more! The sandwich was one of my favorites I've had off a food truck! I was surprised at how good it was. Looking forward to trying some more off the menu. The sandwich was excellent but disappointingly small for the price. I've been to their brick and mortar store a number of times, and the sandwiches there were always substantial. I thought (hoped?) the lower price at the truck reflected lower costs, but instead I got 1/2 the sandwich for almost 3/4 the price. I walked away trying to figure out what else I was going to eat to fill me up, so hungry buyers beware. So glad to see these guys back at L'Enfant today. I've only tried the Havana and Kingston, and both are amazing. Loads of pulled meat with delicious and thoughtful condiments. The baguette pulls it all together and makes this a wonderful sandwich - crusty, chewy, fresh and delicious. I used to work at a top-of-the-line bakery so I know good bread and this is good bread. The baguettes hold up well and don't fall apart on me even after getting a bit soggy from the ingredients. Excellent value for the money. Very good sandwiches at a decent price. Haven't tried any of the egg sandwiches yet, but the Havana is very good. If you're into spicy, go with the Kingston. Just make sure you have napkins. They can be a bit messy (but hey, at least they're not dry). Friendly proprietors, quick service, and very high quality ingredients. One of the best food truck sandwiches I've had. Would definitely return. Small but tasty sandwich, at $6 it is perfect for my budget and appetite. I prefer this to those trucks that offer big expensive piles of meat and bread. The avocado was perfectly ripe and overall the blend of ingredients was quite good. I will be back. SUNdeVICH originally launched at New York Ave Beach Bar, located in Mt Vernon Triangle (645 New York Ave NW) and stated that they would only be serving at that venue. 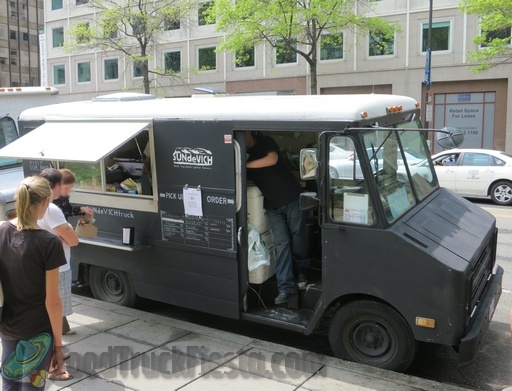 Around July 19, 2012, the truck started to serve at various locations in the District. 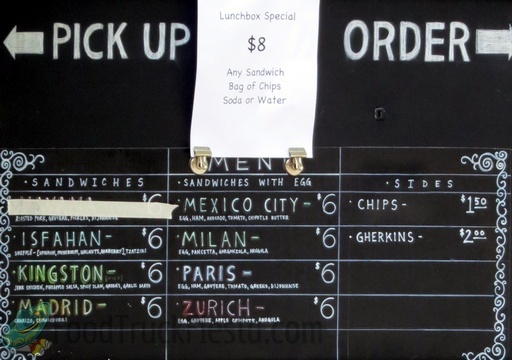 The menu consists of sandwiches named after International cities. They also have a brick and mortar spot at 1314 9th St NW.